Shaun Strickland won the Top Hand buckle. He previewed Lot 6 Mr Top Clabber (Top Horse, pictured here) and Lot 7 - I Got No Remedy. 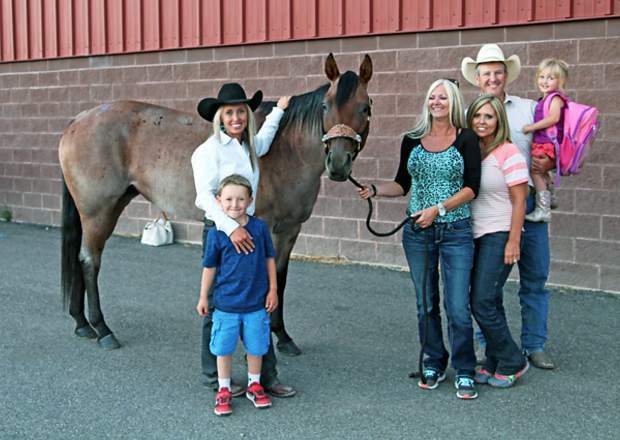 Ginger LaDuke sold Streakin Miss Sarah for $29,000. The top selling horse was lot # 3- Streakin Miss Sarah – a 6 year old own daughter of "A Streak Of Fling" who was the perfect combination of run and cow and had so much to offer from Ginger LaDuke sold for $29,500 to Sydney Ryan of Decatur, Texas. Lot 9 – Spratts Piggy Bank a 10 year old Red Roan gelding – who was a seasoned college level breakaway/goat horse and super ranch horse from Coralee Spratt brought $19,000. Lot 4X – Peewee. Good looking Bay gelding who was the ultimate all-around horse that can do it all and do it well from Will LaDuke sold for $15,500. 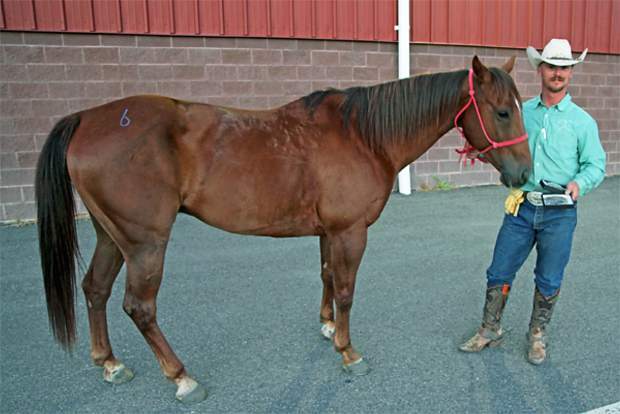 Lot 7 – I Got No Remedy – a 4 year old sorrel ranch horse with a long list of credentials from Shawn Strickland sold for $7,500 and Lot 25 – good looking Buckskin mare used in all aspects of ranching & started on both ends roping from Preston Schwartzkopf brought $7,000. Third Place winner $100 Dean Geesen riding Lot 15 Echos Last . The Top Hand competition, Shaun Strickland, buckle winner. Strickland previewed Lot 6 Mr Top Clabber and Lot 7 – I Got No Remedy.